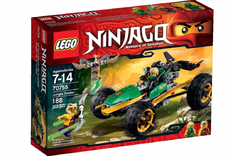 70755 Jungle Raider is a Ninjago set released in 2015. This is a description taken from LEGO.com. Please do not modify it. (visit this item's product page) Overpower the Anacondrai with the awesome Jungle Raider! Kapau has chained the Jade Blade to a stone pillar deep in the jungle and is standing guard with his double-bladed dagger. Place Lloyd in the cockpit of the Jungle Raider and begin a mission to claim the precious blade. The built-in suspension and big rubber tires makes driving over rough jungle terrain a breeze. Aim the powerful spring-loaded dual shooter at Kapau and the stone pillar. Overcome the Ancondrai warrior and unchain the Jade Blade! Includes 2 minifigures with assorted weapons: Lloydand Kapau. Facts about "70755 Jungle Raider"
This page was last edited on 15 March 2016, at 06:04.